Reagan Arthur Books, 9780316198622, 336pp. A year ago, fresh out of Harvard Law School, Mike Ford landed his dream job at the Davies Group, Washington's most powerful consulting firm. Now, he's staring down the barrel of a gun, pursued by two of the world's most dangerous men. To get out, he'll have to do all the things he thought he'd never do again: lie, cheat, steal-and this time, maybe even kill. 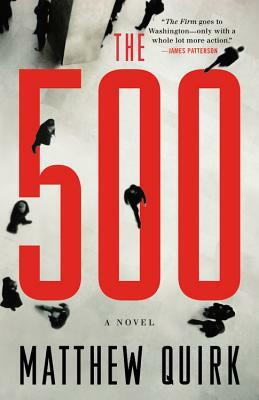 Combining the best elements of political intrigue and heart-stopping action, THE 500 is an explosive debut, one that calls to mind classic thrillers like The Firm and Presumed Innocent. In Mike Ford, readers will discover a new hero who learns that the higher the climb, the harder -- and deadlier -- the fall. Matthew Quirk studied history and literature at Harvard College. After graduation, he spent five years at The Atlantic reporting on crimes, private military contractors, the opium trade, terrorism prosecutions, and international gangs. He lives in Washington, D.C.